← Anyone having a Garden Party? There it is. Just sitting there. Look at it. It’s fun for me to get my box o’ art out for taking to a new show – looking at it reminds me that, gosh, I kind of like the stuff I draw:) Nothing like a frame to spiff things up. 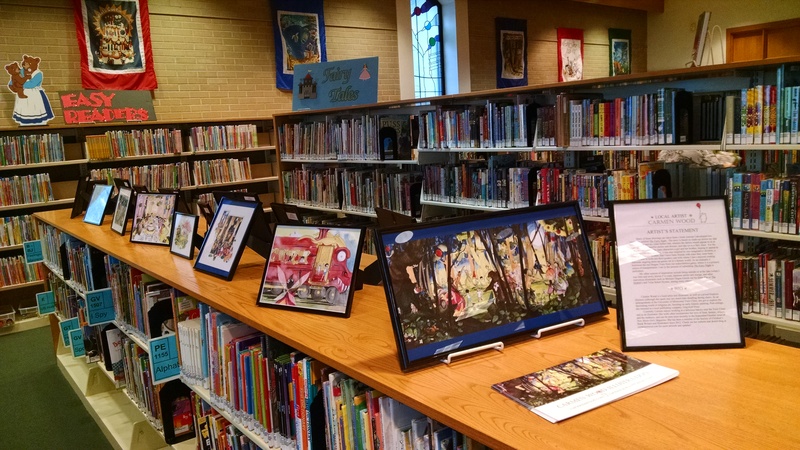 It’s also kind of scary to be set loose with aforementioned box of art in one of my favorite public libraries, with kids gurgling nearby and people actually looking for books right by my display shelf. Don’t mind me! Just setting up my life’s blood on this bookshelf here and walking away. All in a day’s work for CAPTAIN CARMEN. *GO SEE IT. IT WILL CHANGE YOUR LIFE, STOP YOUR HEART, AND REMIND YOU OF YOUR CHILDHOOD. I WOULDN’T MISS IT IF I WERE YOU. Actually, it’s not that exciting. But it’s actually kind of exciting. GO SEE IT.